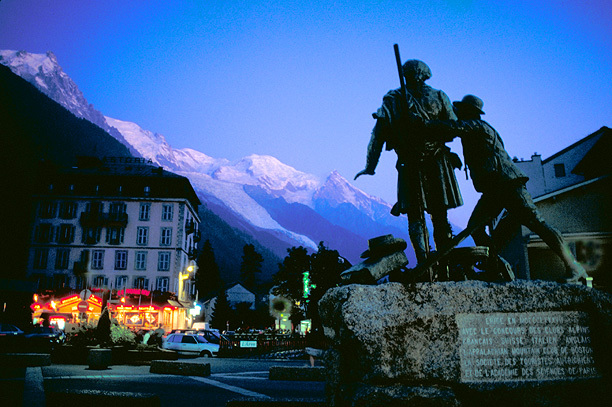 There are two "normal" routes on Mont Blanc, the Goûter route, which climbs from the northwest, and the Traverse route from the northeast. Both routes are long climbs and at very high altitude. 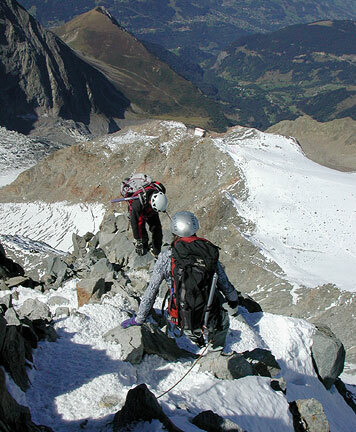 Either route requires a minimum of two days to climb, one to reach a high hut, and the second to climb and descend back into the Chamonix valley. Even though the climb can be done in two days, coming from sea level and attempting it with out additional time acclimating is very difficult and more often than not, leads to an attempt but no summit. Much better is to spend at least 3 or 4 days in the Chamonix (or other mountain center) doing acclimatization and training climbs. The additional time spent at altitudes over 3500 meters will help the body adjust to higher elevations and decreased oxygen pressures. Equally important to spending the days up high, is spending the nights sleeping at altitude. To increase your chance of summit success, spend at least 2 or 3 nights sleeping at elevations over 3000 to 3500 meters. For either the Goûter or the Traverse routes, the Cosmiques hut at 3615 meters above sea level is a good base for doing your training climbs. From this hut there are literally hundreds of fine climbs available. Some of our favorites include the Midi-Plan Traverse, the NW Face of Mont Blanc du Tacul, the Arête des Cosmiques, and the Contamine-Grisolle route on Mont Blanc du Tacul. The Traverse route on Mont Blanc climbs from this hut, so it is especially convenient if you plan on this route. But even if you are heading to the Goûter route, the Cosmiques hut is a good choice as a base. You can always come back down to Chamonix for a night, have a good meal, get a good night's sleep then head up the the Goûter hut. Horace Bénédict de Saussure with Mont Blanc. On this page we describe the Goûter route. This route divides the climbing evenly between the two days. The Goûter hut is situated beautifully on a spur facing the setting sun at 12,500 feet on the Goûter Ridge, with impressive views across to the Bionnassay Ridge. Getting there involves a fairly strenuous hike and scramble, gaining 4700 feet from the Nid d'Aigle, a high cog railway station. On summit day we climb on glacier up over the Dome du Goûter, past the Vallot Hut (for emergency use only) on steepening snow and ice up to 35 degrees, to reach the summit from the west on an airy snow arête. 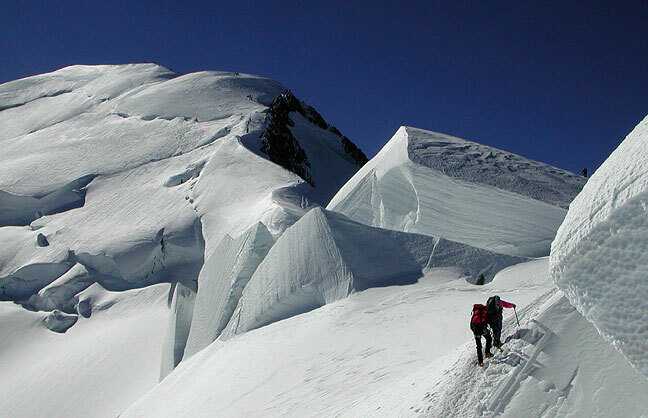 The summit day on the Goûter route involves a vertical gain of 991 meters, or 3250 feet, and the same descent as the Traverse route. Our descent is by the same route with almost 2500 meters (nearly 8000 feet) down to the Nid d'Aigle railway station. Descending from the Goûter hut. The main challenge on this program relates more to aerobic conditioning than technical prowess, with high altitude, combined with significant elevation gain. While most of the climb is on snow and ice, there is a fair bit of rock scrambling getting up to the Goûter hut. Wake up time is usually about 3 am, and after about 4 hours of climbing we arrive on the summit about 8 in the morning. The descent is quite long, however, and we usually don't get back to town until late afternoon. 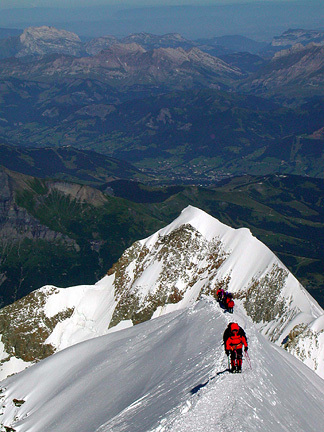 Climbers of Mont Blanc, even by this easiest of routes, need to be in very good aerobic condition. While previous technical climbing experience is not strictly necessary, it is helpful. If you take our advice and do a few training climbs prior to your ascent, you should be ready.